Have you ever sat through a wine lecture and found the discussion so boring? I have… Way too many times. Having suffered through some incredibly boring lectures myself, I have made it a point to be as entertaining as possible. As I was preparing for my wine talk on German wines, however, I found myself in a major funk. I couldn’t crack jokes about their geographical classifications (beyond mispronouncing every word… German is NOT my language). How on earth could I make it interesting? I realized that my audience (college students, wait staff, restaurant managers, drunk dates…) seemed to appreciate a good story. Then, it hit me: There MUST be a correlation with the German brothers Grimm, their ageless fairy tales, and my ability to make wines entertaining. There had to be. I was at my wits end. Fairy tales… BOOKS! We didn’t have a decent library of wine books for nothing. After much digging, I found inspiration (and resource) from Richard Vine’s book, “The Curious World of Wine” (and no, the irony of a guy named Vine getting into wine wasn’t lost on me). Apparently, there are legends and lore in some German wine regions that gave rise to some of their wine labels. For example, in the region of Mosel, there is a wine label called the Berncasteler Doctor. It came from a legend of a nobleman named Herr Ritter von Hunolstein. 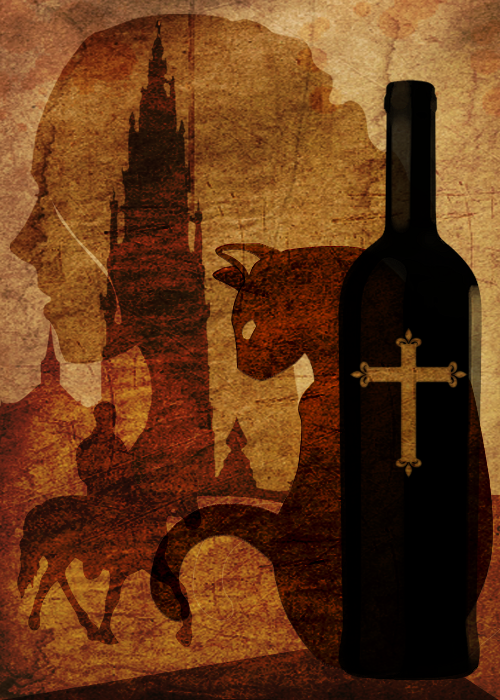 Desperate to find a cure from a mysterious ailment that brought him near death, he was given a bottle of wine made by the Archbishop Boemund to drink. He miraculously regained his health. The wine was thereafter named Berncasteler Doctor, because the wine was like a doctor that cured him. Also in Mosel is the label Zeller Schwarze Katz (Black Cat Cellar). As in some cultures today, in the old days, black cats were considered bad luck. So imagine the agitation of a group of wine makers when they found a black cat lurking in their vineyards right before harvest time. They thought that the harvest would yield bad grapes, but harvested anyway. However, they were surprised to taste one of the finest wines they have ever produced. Rheingau claims that they originated the concept of late harvest wines. Late harvest wines are wines made out of grapes that have been on the vine a bit longer, thus having a higher sugar content. Legend has it that the owner of one of the Rheingau vineyards was a prince-bishop. He was the only person allowed to decide what to do with the vines (when to water, when to harvest, etc). One of his workers, thinking it was time to harvest, asked one of the messengers to go by horse to the prince-bishop and ask his permission to start picking the grapes. The messenger, en route to the prince-bishop, got distracted by a beautiful young lady and wasted precious time to get to his destination. By the time he realized his mistake, got the prince-bishop’s blessing, and relayed the message to the vineyard workers, the grapes were riper than normal upon harvest. Baden is another fascinating region with an interesting tale and an odd superstition. To this day, It is common practice for some vineyards in Baden to have an oxcart pull the first grapes of that year’s harvest. This is to ensure good luck and good wine. However, in classic fairy tale style, there is the tragic story of the Hex vom Dasenstein (Witch of Dasenstein). Once upon a time, there was a maiden who fell in love with a prince. The match was deemed unsuitable by the prince’s parents, for the maiden was not royal. That being an unfit match, the king and queen spread rumors that the maiden was a witch. The townsfolk believed the rumor and locked the maiden up in a tower. Heartbroken, she wept bitterly everyday until she died. It was said that her tears watered the vines below her tower, and that the vines produced lovely grapes which made for exquisite wine. I, however, did not wish to end the talk on a depressing note. So decided to end it in a pseudo-naughty one. One of the mysteries that some monks in Franken took to their grave was the etymology of the Bocksbeutel bottles. The bottles look wide and round, with a narrow neck. Looking at it sideways, the bottles are rather flat. There are two probable origins of the name Bocksbeutel. The shape was a perfect fit for a monk’s robe, so it probably came from the word “booksbudel” (kept bottle). But a fairly perverse origin came from the fact that the shape of the bottle is similar to a goat’s testicles. Therefore, it could have come from the words “bock beutel” (goat sac). What we do know is that Germany produces delicious wine geared towards Filipino palates: sweet, light, yet with a touch of elegance. There is tremendous difficulty finding them here, because Germany does not extensively export their wines. Any tales you want to share? Cheers!